PALM DESERT, Calif. -- Being distinctive in the California desert is a challenge. After all, the Palm Springs area is packed with more than 110 golf courses from the high-priced private clubs to munys a retiree on a budget can afford. That's why Desert Willow Golf Resort, a 36-hole playground, may be one of the best municipal complexes in the country, providing locals a generous price break and golf tourists a top-shelf experience. And it's only minutes away from another prime choice in the area, Marriott's Shadow Ridge Resort, that distinguishes itself with an excellent layout, Nick Faldo Golf Institute and Marriott vacation ownership opportunities. Palm Desert even makes golf courses a showplace for its "Art in Public Places" program -- the entry at Desert Willow is lined with art pieces created over several years by artist Allen Root. And a blown-glass chandelier by sculptor Dale Chihuly, greets visitors in Desert Willow's 33,000-square-foot clubhouse. Out on the Firecliff Course, which opened in 1997, golfers will find another larger-than-life showpiece honoring the Agua Caliente Band of Cahuilla Indians, first residents of the Palm Springs area. Just behind the eighth and 17th holes the golfer views a replica of nearby Indian Canyons, a home for the area's first residents, and location of North America's largest natural oasis of native palms. You will even be greeted by a sculpture as you drive into the clubhouse area at Shadow Ridge. The golf is memorable too. There are more than 30 golf courses within the Palm Desert city limits. Can you say multiple options? Here's a closer look at Desert Willow and Shadow Ridge. "Not often is a church designed for Easter crowds, nor is a golf course designed to host a major televised tournament. But the Firecliff Course was designed with tournament golf in mind." Those are the words of Desert Willow's design team, Michael Hurdzan and Dana Fry, who have become known for environmental gems and extensive ecological savvy. The Firecliff Course, 7,056 yards at a par of 72, is certainly a Top 10 Southern California layout, and past host of the Frank Sinatra Celebrity Invitational, the Subaru Southern California Team Championship and Pepsi Tour events. Dunesy hillocks, native desert foliage and views of the Santa Rosa Mountains frame bowled fairways lined with 110 cloud-shaped bunkers in an Arizona-styled target tract. Desert Willow uses effluent water and the Southern California Chapter of the American Society of Landscape Architects was so impressed it gave them the award for water and land conservation and reclamation. While Firecliff will test the best golfers, Desert Willow's Mountain View Course is more traditional and friendly to the higher handicapper. In addition to the two golf courses, the 540-acre site has plans for on-site resort housing, three hotels and a conference center. Best of all zero houses line the fairways. "We think Desert Willow could be one of the best private facilities in the country but it is our own Palm Desert public course," said Mike Osgood, director of sales. "The guests of the resident love it. The list could go on, including a great restaurant. We are so busy on a daily basis the parking lot is overflowing and if things go well we should surpass the 72,000 rounds of golf played here last year." Opened in 2000, Shadow Ridge is a 6,932-yard, par-71 Nick Faldo-signature layout with design work by Brian Curley and Lee Schmidt. It's hard to go wrong with the stunning backdrop of the sometimes snow-capped Santa Rosa Mountains. Don't let that mountain scenery distract you on No. 17, a 157-yard par-3 beauty. The wind might be in your face as you survey trouble everywhere -- an all-carry huge lake, bunkers and putting surface that slants left to right. Finish your round with a difficult driving hole -- a 446-yard par-4. A stream taunts you to the left of your landing area and huge fairway bunkers follow the left boundary. Faldo certainly met his dream -- a design loaded with strategic options and detail as he drew inspiration from courses like Royal Melbourne in Australia's sandbelt region. "The fairways are generous and the bunkering style is bold," Faldo said. "And the greens have plenty of subtle undulations that reward and encourage a variety of approach shots." Visuals greet you on every hole. White sand and waste bunkers are bumped up against native tawny grasses or reed-filled ponds, but on the whole fairways are wide and friendly. When you do miss the putting surfaces here most likely you will roll into tightly mown collection area or a greenside bunker. That's where a visit to the Faldo Golf Institute can come in handy to help with your short game. Shadow Ridge is home to Marriott's third golf school along with Marriott's Grande Vista in Orlando and the Marriott Seaview Resort in Absecon, N.J. This Faldo Golf Institute features one of the largest, most unique practice facilities in the world with 20 acres of dedicated practice area. For more information or reservations,visit palmspringsgolfcentral.com. Marriott's on-site villas will spoil you. Why stay in a hotel room when these timeshare beauties give you abundant space, full kitchen and views of the fairways or mountains? You also have access to a fitness center, pool, tennis courts, clubhouse with restaurant and grills for a barbecue. Typical villas are 1,250-square feet, two-bedroom, two-bath floor villa, two TV's, VCR, washer-dryer, microwave, dishwasher, full-size refrigerator, stretch-and-soak tub, separate shower and two separate vanities. Rental rates are as low as $99 in the summer. 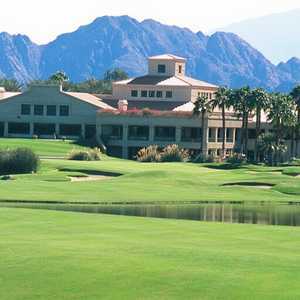 When you play at Desert Willow stay at Lake La Quinta Inn. This is luxury in a B&B format just minutes from La Quinta Dunes and Mountain Courses and the PGA West courses. This Inn will spoil you with great breakfasts and themed rooms. One is the St. Andrews Room decorated in Scottish plaids, golf books and wall hangings. For more information or reservations, visit palmspringsgolfcentral.com. Desert Willow's restaurant is packed on a daily basis. Whether it's a great hamburger off the grill, an elaborate banquet for 200, or weekend breakfast on the Patio, the food offered in the Clubhouse dining facilities are outstanding. Try Salmon Haida and Penne Pasta or Middle Eastern Falafels. You will agree the menu selections offered at Desert Willow are not what one expects to find at a golf resort. The main dining room is open for breakfast on weekends and lunch seven days a week.